I love autumn, and I enjoy sharing all the elements of the season with my students. In this lesson I shared the fabulous book Leaf Man by Lois Ehlert, which never gets old for me even though I’ve been reading it aloud for ten years! 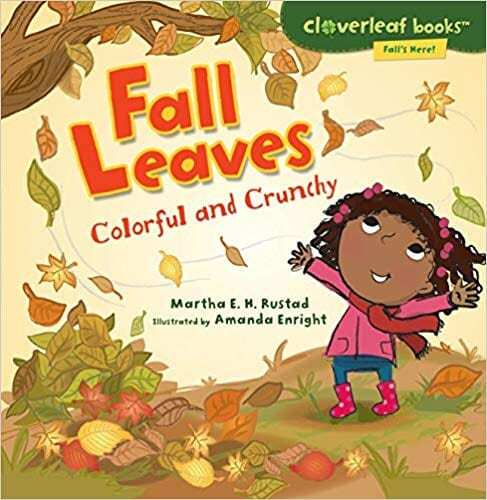 We followed the book with a discussion of all the items she was able to make with leaves, and then we brainstormed ideas of other pictures that could be created. I then gave each student a sheet of plain construction paper, and an assortment of real leaves and acorns from my yard. Ordinarily I would take the students on a nature walk around the school grounds to collect materials for this project, but Hurricane Michael closed our school and then left a wet mess behind. As we talked about what body parts people and animals have, the students experimented with different sizes and shapes of leaves to design their own leaf pictures. And while they were making art, I was taking photos! We ended our time together by returning to the rug and singing Autumn Leaves are Falling Down by The Kiboomers on YouTube. I chose this song because it mentions the colors of the leaves that fall from the trees, which is one of the facts I wanted the students to know. I reinforced that concept with our line up activity: When I called a child’s name, s/he had to name a real leaf color (green, yellow, orange, brown) before lining up. Do you share the beauty of autumn leaves with your students? Please leave a comment and share your ideas! 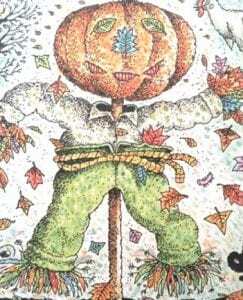 This one has been around for several years but it’s still a fun celebration of the beautiful foliage that is synonymous with autumn. 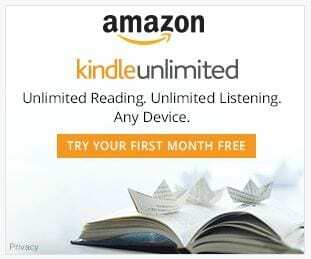 Because it’s written on two levels (simple narrative main text, plus more information shared in side notes) it works for preschool/kindergarten and elementary learners. 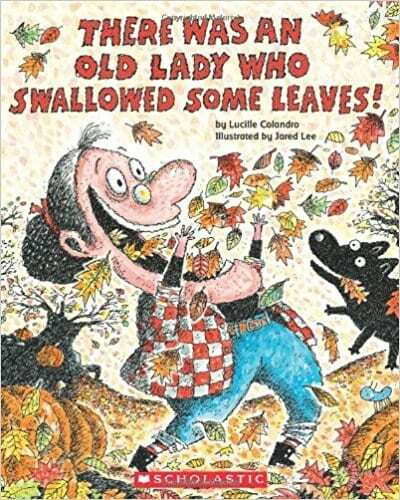 This book is part of a series which includes five other books about the season: Fall’s Here! 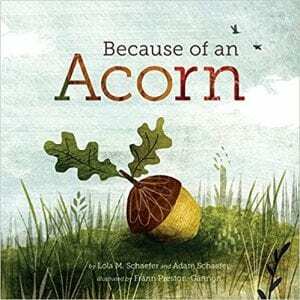 A simple cause-and-effect book that depicts and entire ecosystem then circles back to the acorn as it falls from the oak tree. It’s a book intended for young students, but children of all ages will appreciate the detailed artwork and the progression of ideas as they flow through the cycle of nature. 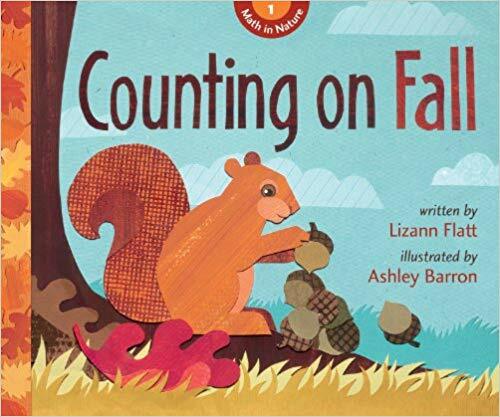 Another book for younger readers, this is a nice addition to a STEAM collection because of the math connection to the scientific world of nature, with some creative collage art to round things out. It explores numbers, patterns, shapes, estimation, etc – all within the context of animal behavior and traditional symbols of autumn. This book is also part of a series: Math in Nature. Part craft book and part field guide, this is a book just begging to be used in a makerspace! 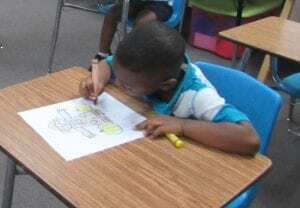 The illustrations do a nice job of showing the reader how to follow the written instructions, and the projects are easily do-able by even young artists. 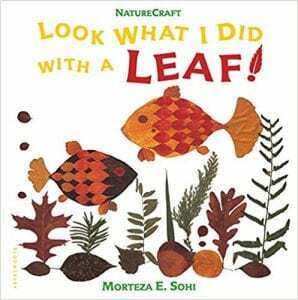 As someone who has used leaf-picture activities with my students and my own children, I was very pleased with this book. 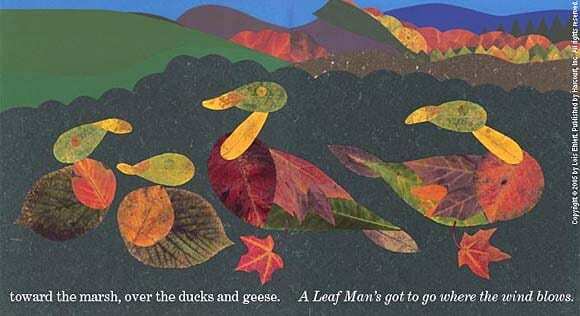 And of course if you’re going to make leaf pictures, you MUST share this inventive book first! 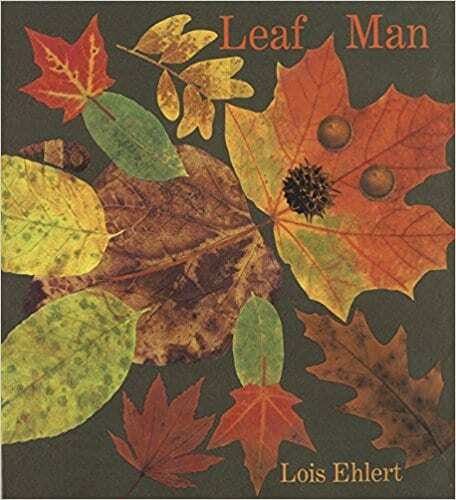 The books I’ve mentioned so far have all been nonfiction, but we’re moving into pure fantasy now as we marvel at the collages Ehlert creates from paper leaves showing us animals, vegetables, and leaf people. The regular version of the book is fine, but if you’re using it as a read aloud you may want to invest in the big book edition so your audience won’t miss the small charming details, such as the mice in the pumpkin patch. 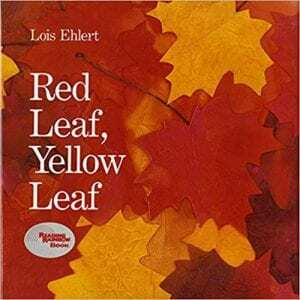 If you want to go beyond leave to the life cycle of a tree (a sugar maple, to be specific) this is another winning title from Lois Ehlert. 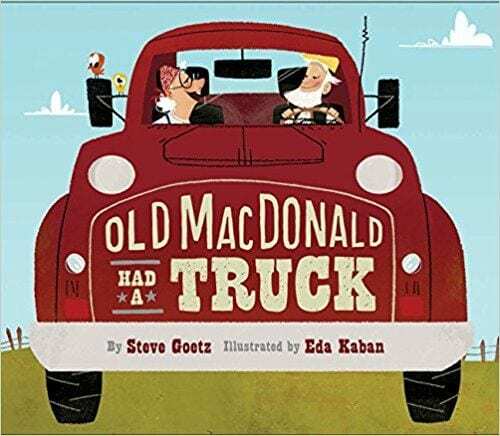 The vibrant illustrations are sure to draw the reader in, and the factual details are communicated in a lovely narrative told from a child’s point of view. 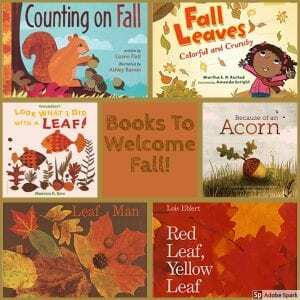 Our most recent story sessions have focused on trees and orchards, so our next logical step was to talk about leaves and the seasonal changes they are starting to go through. 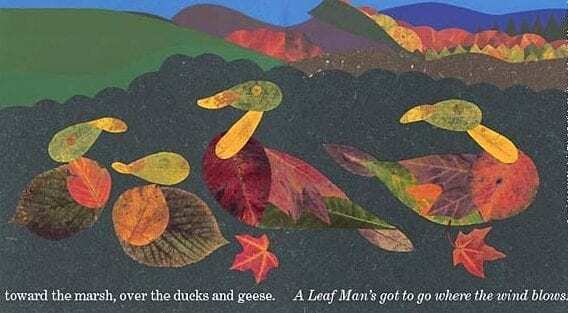 Not only did we see leaves on every page of the book, but at the end of the story (spoiler alert!) the old lady sneezes out a scarecrow, which provides another seasonal icon to work with! We had an interesting discussion about the purpose of a scarecrow. A few children knew it was for scaring birds away, while others insisted it was a Halloween decoration. We finally agreed that both uses were important. After the story it was time to move around, so we learned the Scarecrow Dance using the video for the Scarecrow Song by the Learning Station on YouTube. 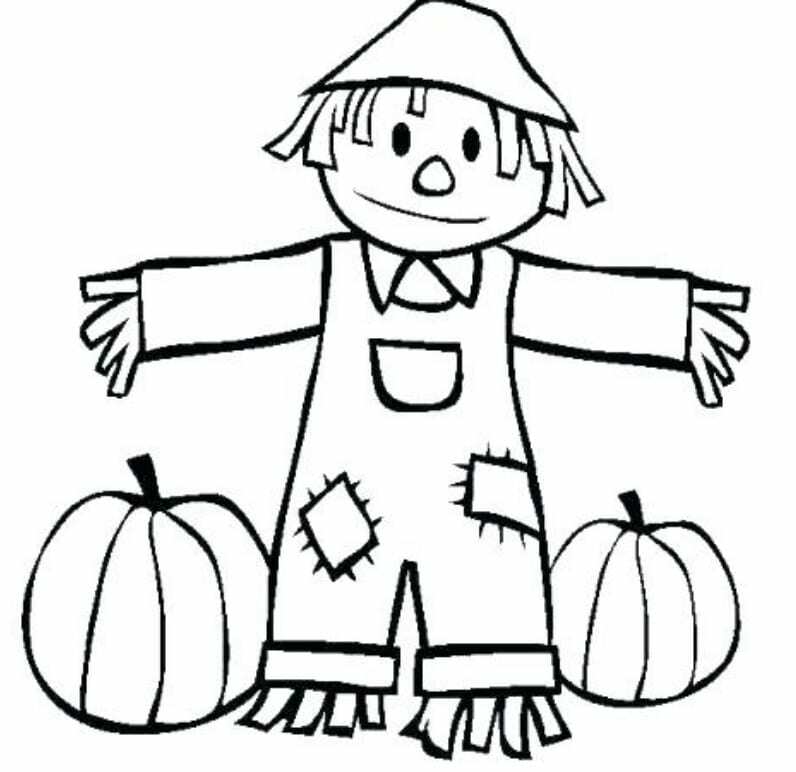 I almost used the video/song Dance Like a Scarecrow but in the end I preferred the way the “Scarecrow Song” kept repeating and got a little faster each time. That gave the kids a chance to practice the dance, and they really like it when things speed up the longer you do them. 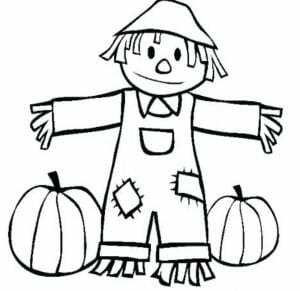 Then we worked on small motor skills with a simple scarecrow coloring page. 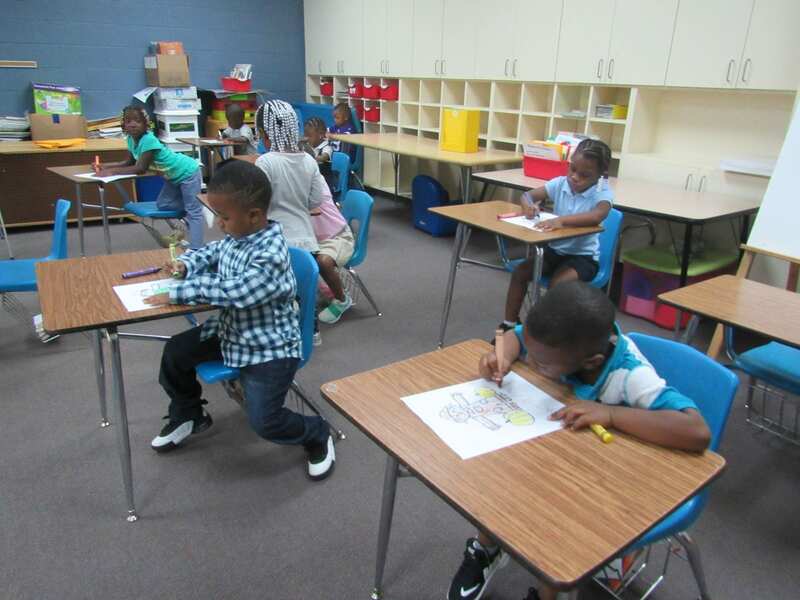 Some students surprised me with how well they were already coloring, but others were mere scribblers. All were proud of what they created though, as evidenced by their enthusiasm for “show and tell” time when we came back to the carpet to share the pictures. 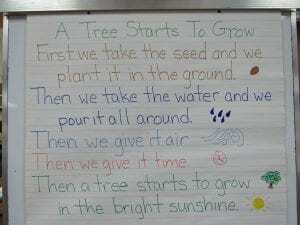 As a callback to our last story time we began our session with the song Way Up High in an Apple Tree by The Learning Station. 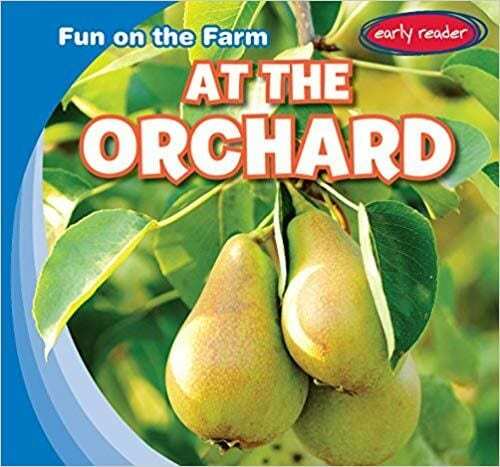 Then I shared the nonfiction book At the Orchard by Bruce Esseltine which depicts a variety of fruit trees and provides a nice opportunity for students to identify different types of fruit. 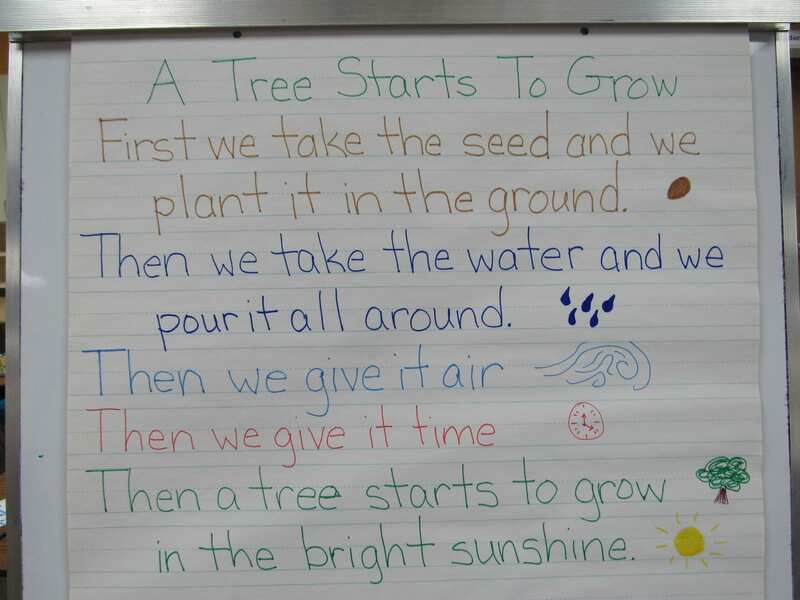 That led us into the rhyme A Tree Starts to Grow which I got from Miss Nina’s Weekly Video Show on YouTube. I did not use her video with the students; instead I made a chart of the words and taught it to the children myself. (Click the image to enlarge it.) I always try to alternate sitting still for a story with some singing and moving so the kids don’t get too restless. Then I used the Epic! 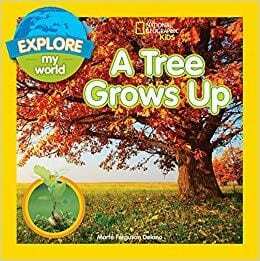 ebook website to share A Tree Grows Up by Marfe Delano, which is a colorful look at the life cycle of a tree. I love the close-up of acorns on the title page, and the fact that the book mentions that acorns are food for different animals as well as seeds for trees. I brought in a couple dozen brown and green acorns from my yard, and the last few minutes of our time were spent examining the acorns and describing how they feel. Our “lining up activity” was for each student to place his/her acorn in the correct cup (brown acorns in the brown cup, green acorns in the green cup) on their way to the door. 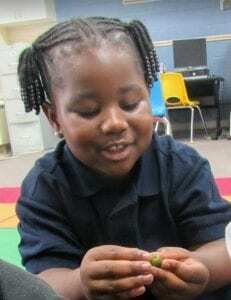 I sent the acorns back to the classroom to be used in the math center for counting and sorting. Do you have some additional resources to recommend? Please leave a comment! 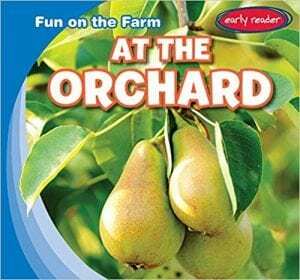 This week my story time focus shifted from animal farms to fruit tree farms. My theme was apples, and it was a multi-sensory experience for the children. I started by reading aloud At the Apple Farm by Rachel Albanese, which is a nonfiction account of a mother and daughter visiting an orchard to pick baskets of apples. I had a real basket with a couple of apples in it for the students to pass around while we reviewed what we just learned about apple farms. 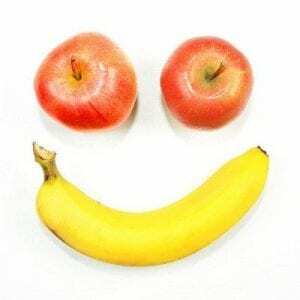 Then it was time to get up and dance to the song I Like to Eat Apples and Bananas. I used a music video from the Tumblebooks website, but there are also a few versions of the song on YouTube, including the one by The Learning Station. Once again I used the Epic! 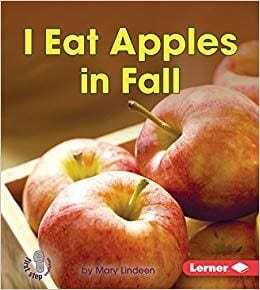 ebook website to share I Eat Apples in Fall by Mary Lindeen. 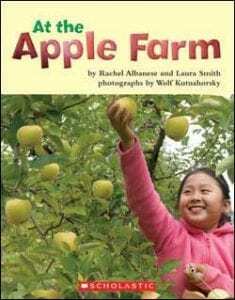 This book shows children of different ethnicities picking and enjoying apples, and it also highlights the different colors of apples, which led into our apple tasting. 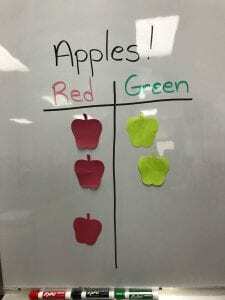 I brought in bags of red (Red Delicious) and green (Granny Smith) apple wedges and gave the students one of each to touch, smell, and taste. 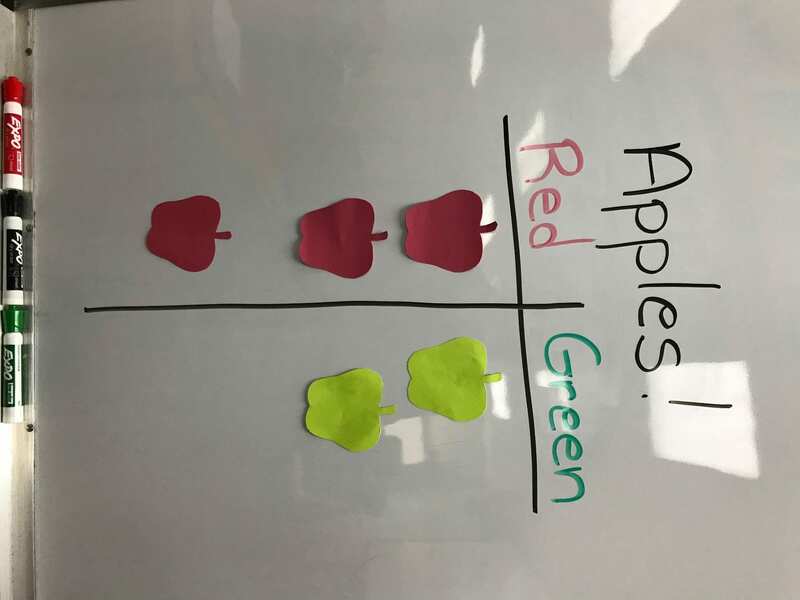 We then used paper apples to chart each child’s preference to determine which flavor was the most popular. The students ended our time by “picking” a paper apple off of a paper tree and placing it in the appropriate basket (red apples in the red basket, green apples in the green basket, yellow apples in the yellow basket) on their way to line up at the door. Do you use apple books and activities in your story time? Please leave a comment and share! After spending two years at a school that housed 4th and 5th grade only, I’m thoroughly enjoying leading story time for younger students again! For the last couple of library visits I’ve been focusing on farm animals. 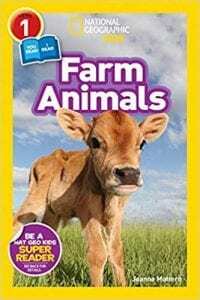 The first time I used several nonfiction books, along with a spirited rendition of the song Old MacDonald Had a Farm complete with flannel board pieces. 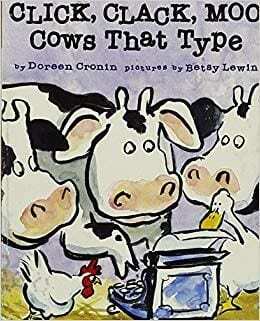 Click Clack Moo Cows That Type (by Doreen Cronin, illustrated by Betsy Lewin) This classic book is a crowd-pleaser for children and adults alike which shows how the farm animals work together to negotiate with the farmer for what they want. I’ll probably use some of the sequels during future visits. 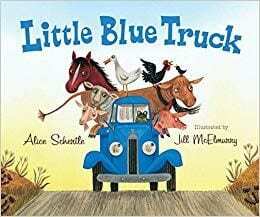 Little Blue Truck by Alice Schertle, illustrated by Jill McElmurry) A rhyming delight AND an opportunity for students to chime in with both animal and vehicle noises AND a sweet message of friendship, all in one book. (There are more books about the Little Blue Truck too.) And it segues perfectly to the next book…. In our back-to-school meeting today at Vance Providence Elementary School, our faculty was asked to choose a watchword for this year. As the morning went on we heard from our principal, our guidance counselor, our secretary, and others on the faculty and staff. As I listened and made note of the information being shared, the question lingered in the back of my mind: What word will define my attitude for the year? What word will sum up what I want my co-workers to notice about me? What word can I use to remind myself of what is truly important this year? 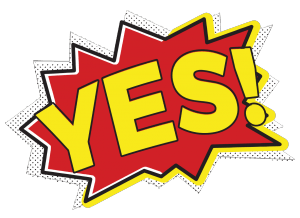 The word I chose is Yes. That one simple word represents my desire to assist and support the teachers as I begin my education journey with them. So many times in the past I’ve had to tell teachers “no” when they needed something because my time was completely taken up with conducting Library classes. This year I have a flexible schedule, so I can be there with resources, with ideas, with collaborative teaching plans, and with technology innovations to empower them in their classrooms and beyond. 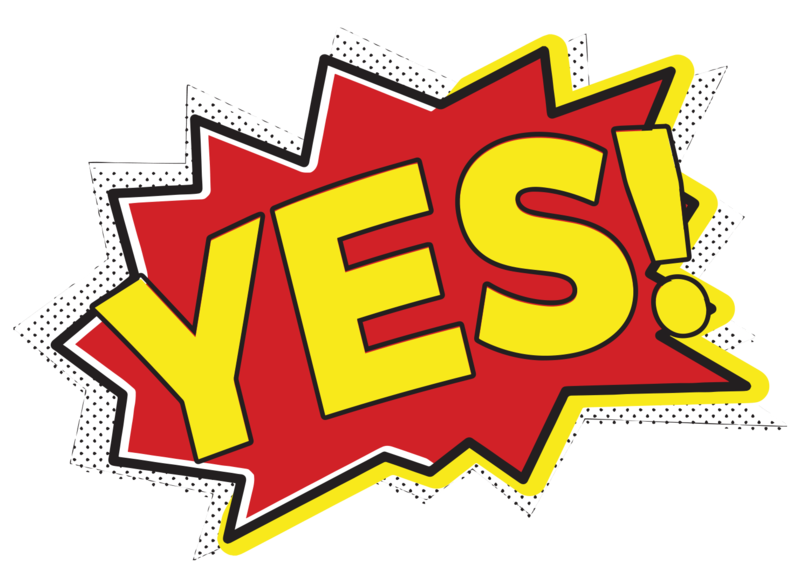 Whatever a teacher asks me for this year, I want to be able to say Yes to it. You’re having technical difficulties with your document camera? Yes, I’ll come look at it. You need enough folk tales for every student in your class to have one? Yes, I’ll bring a selection to your classroom. You want to use a Promethean flipchart to give students practice classifying different types of rocks? Yes, I’ll help you create that. You’re looking for a website to help students learn more about Greek and Roman mythology? Yes, I’ll find one for you. Yes, it will be a juggling act at times, but YES it will be worth it to help our teachers accomplish their goals! What’s your word this year? I’d love to hear about it in the comments.